Patrick and JB talk about Raiders of the Lost Ark. Sort of. One thing that could also be fun would be to take the first film in a series and contrast it with the last one. Also, "Sleeping Dogs Lie" is the film. YES! Thank you. It popped into my head at about 4 a.m. a few days after we recorded. GREAT TIMING. Great podcast! And the reason Marion wasn't in 'TEMPLE' was because that takes place i think a year before 'RAIDERS'. I'm not an indiana jones enthusiast, so i can be completly wrong about that but i think that's right (and because speilberg wanted his dumb wife in it). And you guys talked about film preservation toward the end and i was wondering if you guys have seen 'These Amazing Shadows'? If you haven't seek it out, it's really great, in my opinion of course. Yeah, the first reason you give is the textual reason for Kate Capshaw's presence, but the second reason you give is the ACTUAL reason. I'll definitely check out These Amazing Shadows. Thanks for the suggestion! These Amazing Shadows is great; reminds me of why I love movies so much. Interesting. Kuffs reminds me of why I love movies so much. I remind myself of why I love movies so much. This is a great post, and not just because my name is mentioned (although I am very vain). It's great because you watched IT'S A WONDERFUL LIFE and BACK TO THE FUTURE, the best movies ever! Thanks Anonymous! Raiders was my favourite book when I was a kid, because I would turn the page when I heard a chine sound like this *ting-da-da-ling". Read a long books were cool. The Raiders Read-along book was exceptionally cool because, instead of featuring a contextless chime, you knew it was time to turn the page when you heard Indy's bullwhip crack like this "Ka-thwacka- ka-thwacka". This episode was awesome (one of my favorites). It was like two great musicians riffing for an hour. Maybe it's because I understand how far of a walk it is to Woodfield. JB - EXCELLENT suggestion about Mel Brooks and Carl Reiner watching TV - here are two big sacks of money...MAKE THAT HAPPEN!!! I would be glued to the TV!!! Speaking of little movie moments (and in a continued effort to justify my love for this recent release), I love in Guardians of the Galaxy when Groot stops to pick a flower off of himself and gives it to a little girl. So sweet. 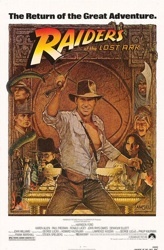 I was 5 years old when I saw Raiders of the Lost Ark (in the early 80s). I loved it but cried at the face-melting scene at the end besidbecause to me, two men just died. I've seen it recently on Blu-ray and it still looked good. I'm wondering if Lucas had made it now if he would have used CGI to recreate the practical effects. I think he would have, to the movies detriment.